Category Archives: Online Marketing for Professional Medical and Dental Providers. It is one thing to say yes to an online video marketing strategy, it's another to actually take action. One of the biggest barriers to video creation is taking that first step in front of the camera. What do I say? Will I look bad? Who will actually watch this thing? 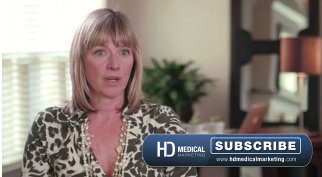 Recently, I took an official step in front of the camera as the founder of HD Medical Marketing to explain who we are. I knew who my audience was, what problems I was hoping to solve, and what I wanted them to do within the video. But getting in front of the camera felt no different from what my clients often tell me they experience. What we do we to help get past hurdles? Funny enough, the biggest step is to get the video shoot scheduled. You're on the hook to get it done and that proverbial bus is rolling. Here we are at the shoot, 5 days after we scheduled it. A little nerve-wracking but in the end, getting it scheduled was the best thing I could have done. Next week, I will share what we did to prepare for the video shoot. See you then. Online Marketing for Professional Medical and Dental Providers.